As a soloist specialising in Jewish music, Mich is available for weddings and synagogue services. Comfortable with a range of styles, from classical to musical theatre, she was honoured to open the gala concert at Limmud Convention 2014 alongside Cantor Zoe Jacobs, Judith Silver, and Rachel Weston. Mich became a Licentiate of the Royal Schools of Music (LRSM) in Singing in December 2013. 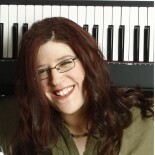 As a singer-pianist and songwriter, Mich has been guest of honour at filk [sic] conventions in Atlanta and the UK and shortlisted for the international ‘Best Performer’ Pegasus award five times. Her album ‘Just Beyond‘ has raised over £1000 for Cancer Research UK and she has taught on the song-writing course at Roehampton University. Mich performs with Marilisa Valtazanou as folk duo Playing Rapunzel. Their albums can be found on Bandcamp.